Douglas F. Bulloch of "Draggin Lady"
"We were so young that you don't realize what you've gotten yourself into." Z Square 6 the " Draggin Lady", took his final flight on January 14, 2017. 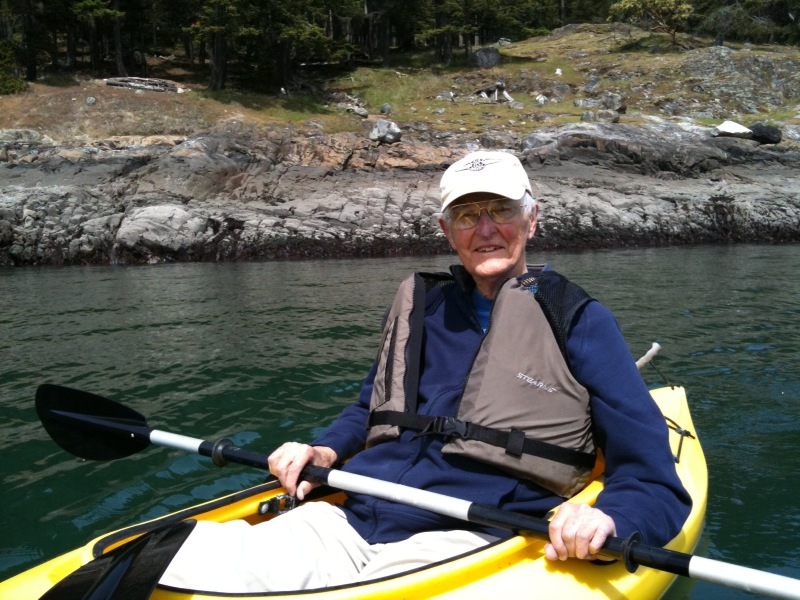 It was a pleasure and an honor to have known Doug, and his contributions to our research were invaluable. Definitely will miss him. This link can also be found on our Links page. It is an audio interview that is very interesting. I have had the privilege to contact and get to know two of our Uncle Bob's original crew mates from 67 years ago, radio operator Charles Maples, and left blister gunner Douglas Bulloch. 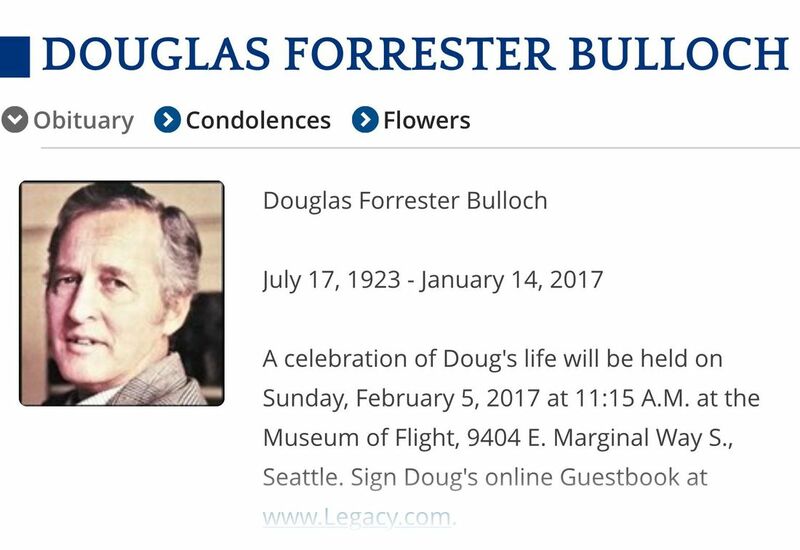 The following is a narrative of some of the remembrances of Douglas Bulloch. Doug reported on his A/C that "Richard Field was a really good guy and a great precision pilot, who protected his men." Doug thinks that Captain Field flew submarine patrol duty on B-25's before joining the B-29s of the 73rd Bomb Wing. He said Captain Field was well respected and liked, and was a reserved and by-the-book commander, but extremely fair. Patrick Calhoun replaced Capt. Field in December of 1944 on the Z Square 6, and Doug said he was quite different from what they were accustomed to. None of the crew was happy about Calhoun's promotion to A/C of their ship, because they felt Co-Pilot Richard Dodds should have gotten the position. Calhoun was from Atlanta, Georgia, enjoyed a good time and sometimes took liberties with the regulations. Doug said his first encounter with his new A/C occurred when he rode along as "spotter" on Calhoun's check out flight in the left seat, and he thought it might be his last. Upon landing, Calhoun missed the runway and the wheels of the plane were "throwing coral all over the place, some pieces as big as bowling balls." Not a good start. On one mission near the target when radio silence was ordered, "Calhoun could be heard chattering away and the squadron commander had to tell him to "knock it off." mission, he maneuvered it into position to protect another badly damaged B-29 even though his own ship had been hit in the right wing, and bullets had barely missed Lt. Dodds in the Co-Pilot position. Doug and his crew joined the 73rd Bomb Wing in Kansas in the summer of 1944, and they were in the second group to complete their training and head overseas. The first group went to China in the CBI Theater. Initially Doug and his mates trained on B-17s at Victoria, Kansas, that were in "terrible shape." But, that kindled Doug's memory of the following funny story. On his very first training flight on a B-17 as waist gunner, Doug wasn't sure if he needed to wear his complete fleece-lined leather flight suit, so he decided to ask Charles Maples. Charles told Doug all he ever wore was the hat, jacket and boots, so Doug replied, "ok, that's what I'll wear." Doug soon found out that was a problem. As radio operator, Charles sat forward in the plane in a warmer section next to his radio equipment, that was next to a Plexiglas window that generated some heat when the sun was out, and he was out of the wind. Doug told me that, "back in the waist of that plane the freezing wind whistled through those open windows and my legs froze........I was rubbing them and stomping around to try to get them warm." Needless to say, Doug wore his fleece lined pants from then on in the B-17s, and joked that the didn't ask his "buddy Charles for much more advice." Doug said once they received their B-29s that their training was much better because it was "a very comfortable, steady airplane." Leaving Kansas, they proceeded to Kearney, Nebraska, where they were delayed for repairs to Z Square 6 when the ground crew severely damaged the tail section of the aircraft when removing it from a hanger. That made them the last plane in their squadron to arrive in Saipan, and Doug thought perhaps that was why the plane was named the "Draggin Lady." Doug stated he really liked his fellow crew members, and that our Uncle Bob was a "quiet, very serious type guy." Doug reported on his A/C that "Richard Field was a really good guy and a great, precise pilot, who protected his men." Doug thinks that Captain Field flew submarine patrol duty on B-25s before joining the B-29s of the 73rd Bomb Wing. **Doug noted that he had gone to Gunnery School for six weeks in Denver, Colorado for the remote control gun systems on the B-29s. After their arrival on Saipan on 18 November 1944, Doug said he and his crew made a couple of practice missions before they made the "big one." They participated in the first raid on Tokyo by Saipan based B-29s on 24 November 1944. I asked Doug if he had been afraid on this or other missions and he paused for just a second and then answered.........."we were so young that you don't realize what you've gotten yourself into." Then he mentioned that he always carried extra .45 caliber clips for his pistol in case he was shot down. He told me he didn't like the idea of being be-headed so he thought "I'd try to fight it out." He reiterated that the six enlisted men in his crew were very "close knit," but that they were also pretty close to the other three enlisted crews that shared their Quonset hut. Sadly, he told me that after one mission half of the cots in the hut were empty because twelve (12) men had been lost. He said that "was a very sobering moment." On a lighter note, he told me of being on guard of the airplanes on the hardstand one night. Here's how he told it: "A Japanese plane come over with it's landing lights on and it's landing gear down flying at less than 1000 feet..........usually a sign for a message or surrender. The plane was high lighted by our search lights, when it opened it's bomb bay doors and dropped a bomb." Doug said everyone scrambled for the shelter and he got there first, and suddenly six other guys landed on top of him. He said he temporarily forgot the Japanese fighter plane with all that weight on him! After the crash of the "Draggin Lady" in February 1945 when lost by another crew, Doug and his crew began flying a ship called the "Booze Hound." They shared this B-29 with another crew, accumulating a total of 35 accredited missions between the two, enough to go home. That was the goal. Do your job and go home....alive. In answer to my question about pressurization, Doug replied that once they reached the coast of Japan, they "de-pressurized the plane and went on oxygen masks." He stated it was too dangerous of a risk to be pressurized and be hit by flak or cannon shells from a fighter over the target. I asked him as the left-gunner if he had gotten any "kills" of Japanese fighters. He said when flying with Lt. Calhoun they were usually in the low element and kind of took a beating from flak and fighters. (He did not remember ever flying as the lead plane.) Stating "the B-29s and fighters were going so fast in passing when you got off your short burst it was often hard to tell if you got a hit." But, he's sure he got one-a Twin Engined "Nick." He recalled hearing Wortovitch yelling into the inter phone that his guns wouldn't fire, so Doug fired the lower aft turret at the fighter and saw his tracer bullets striking it. He told me "I saw the plane peel off and curl downwards." Sometimes, he went on, the men in the forward compartment had different views or observed things differently than had the men in the aft compartment. Doug felt that "either the men in the front couldn't hear us shooting, or they couldn't see the fighters attacking the ship from the side and rear." On the first one, Doug was the last man in the squadron to see a damaged B-29 that got turned around after a mission and flew in the wrong direction towards Russia. Doug recalled that we hadn't captured Iwo Jima yet, and since the crew knew they couldn't make it back to Saipan, they headed to what they thought would be the safety of Russia. Since Doug was the last man to see this B-29 leave, he had to make a personal report to "some colonel". Doug said he "completed my 35 credited missions plus 3 practice in July of 1945, and was on my way home in August of '45 aboard an armed cargo boat." Doug stated that B-29s were really overloaded with bombs and fuel when taking off from Saipan, and the take offs were extremely dangerous. He said the runway was on a small plateau and at the end of it was a hill that dropped off about 200 feet into the ocean. He said that the pilots upon lift off would apply power and dip down toward the ocean to pick up speed for lift off. He also believes that they received a ground effect from the ocean to get them going. At times, there was a Catalina "Flying Boat" circling off shore to pick up crew members of B-29s that crashed on take off. He remembers one mission where another B-29 ditched off the coast of Japan after their bomb run, and Doug's crew radioed the downed planes position. The crew was rescued by a submarine, and eventually returned to Saipan. (Doug did not remember the planes name or how many crewmen survived.) After their return to Saipan, Doug said he talked to some of the men who survived the ditching. The survivors said they prepared for the ditching but that it was extremely violent and the plane broke in half, and that some of them were "thrown" out of the plane. Luckily, they had badly needed life rafts. Which led Doug to speak about the "ditching training" in which he participated that is located in the attached newspaper article of the "Draggin Lady" crew. He said they did this training in the B-17 leather, fleece lined flight suits that were extremely heavy and cumbersome, made worse by being saturated with water. He said this training was "scary" as the men jumped into the pool, come to the surface, and then had to pull themselves into a life raft. Doug told me about the original survival kits issued to the men, that were more like jungle kits that contained a machete etc. Doug laughed about this because he said the B-29s were always over water on their missions. He said eventually these survival kits were eventually altered, and most men were issued a one-man raft in case of a bail-out a a ditching. When asked about his responsibilies on the missions, he said in addition to being the left gunner, he was also called a "spotter." On take offs he notified the A/C that the engines were running smoothly and the flaps were in the correct position. During flight, he also kept an eye on the engines in case of trouble. He said on one flight the number 2 engine began to smoke badly, so he notified the Captain and that engine was shut down, but they made it home okay. According to the ground maintenance crew, the oil cooler on the number 2 engine went out and was dripping oil onto the hot engine causing all the smoke. After WWII, Doug took advantage of the G.I. Bill by obtaining a degree in engineering from Hofstra University. He worked for Boeing Aircraft for 30 years, and also worked as a volunteer on the B-29 still located in Seattle, the T Square 54. This airplane survived almost 40 missions during WWII, also flying out of Saipan.